Fully updated, flexible resources taking an active-learning approach that encourages students to aim higher in the 0500, 0524 and 0990 syllabuses. With travel writing, magazine articles, blogs and extracts from writers such as Roald Dahl and D. H. Lawrence, this Cambridge Elevate edition helps students develop their English Language skills through an active, communicative approach. 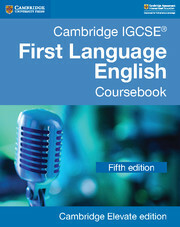 The first unit in each part covers text analysis, summary writing and note-taking. The second deals with directed writing and the third looks at descriptive and narrative composition and includes suggestions for coursework topics if your school follows this pathway. Suggested answers to the questions in this digital resource are included in the teacher’s book. Personalise Cambridge Elevate editions to your needs – set homework, link to the web and share annotations with your class. 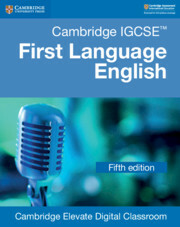 The material in this title addresses the needs of students who face the new exam. Course structure follows a spiral curriculum, providing opportunities for students to consolidate and build on prior learning, in order to fulfil their full potential. Improved skills signposting between resources in the series makes it easy to plan schemes of work and lessons. International texts across 6 continents – such as a panda conservation article from China and a travel guide from Machu Picchu – make reading interesting and relevant for everyone. A focus on writer’s effect and the way we use language helps students develop a personal style and an awareness of audience. 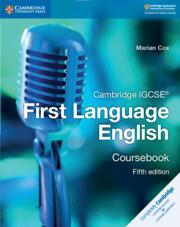 The coursebook contains two optional units dedicated to improving speaking and listening skills. Written by Marian Cox – examiner and experienced international school teacher. Marian is also the author of Cambridge Checkpoint English Stages 7–9, resulting in a coherent 5-year English programme. Simple and easy to use, link directly into Cambridge Elevate from Moodle, Blackboard and any other VLE.